Meet your new summer friend - a sauce so bright and fresh that it begs to be slathered on grilled meats, diluted into a salad dressing or smeared on toasted bread with a slice of fresh tomato. 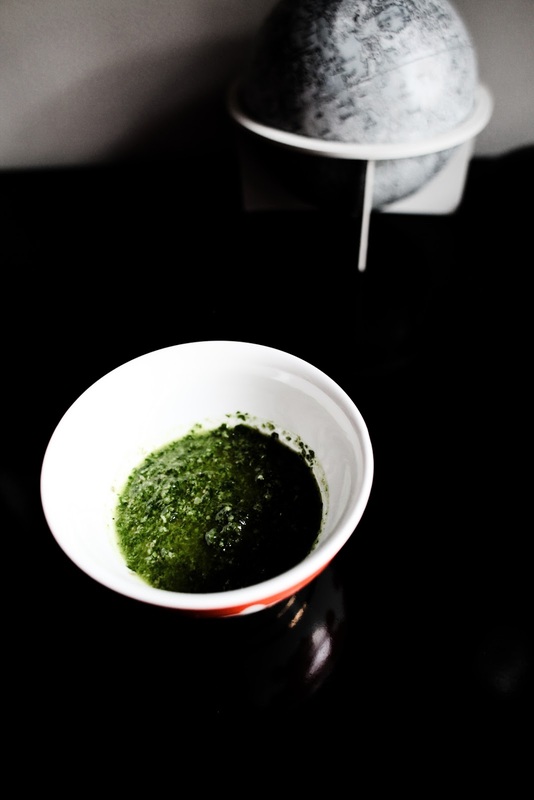 A simple riff on a chimichurri, you won't know what you did without it. It only takes a few minutes to whirr around in your food processor and can be adapted to fit what you have on hand. Then you can leave it in your fridge for weeks at a time, and it will be there waiting for you to come back and eat it some more. Put the peeled garlic in the food processor and run until finely minced. Add the parsley... it will spin around, chopping some and leaving the rest stuck to the lid, use a spatula scrape it down and process some more. Splash in your vinegar and your handful of capers, process some more (scraping when needed). You should have a pretty sparse looking processor bowl of chopped stuff. Now you could go crazy and add some sun dried tomatoes (the oil-packed ones in a jar please) or some roasted red peppers or olives or a little fresh basil... you can do whatever you want! Now, my food processor has a little hole in the lid where you can pour liquids in while the machine is running, maybe yours has some kind of top hatch too? I start the processor and very slowly drizzle in the olive oil. Eventually everything will come together all at once. You will notice that what was a bunch of wet chopped ingredients suddenly becomes a homogenous mixture moving around the processor. Open the lid and check, taste, and adjust. The flavor should be bright and sharp; the raw garlic pretty powerful. It will taste great on those steaks coming off the grill or brushed on those shrimp kebabs.